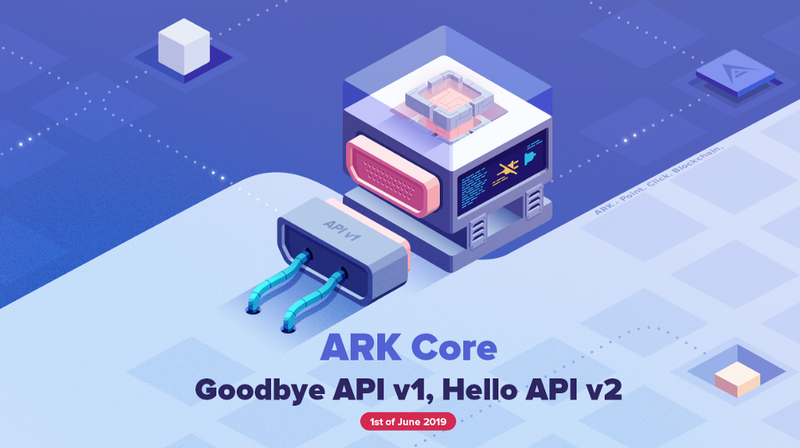 In November 2018 we migrated to ARK Core v2 on our Public Network. All exchanges, node operators and API users were recommended to migrate to the new v2 API along with the update to ARK Core v2. As of now the Public v1 API is still maintained, however this will change on June 1st. API v1 will reach its End Of Life cycle at that time. If you are still using the old API v1 you must migrate over to API v2. After the 1st of June existing nodes will no longer respond to v1 API calls. We chose to continue supporting the v1 API during the Core v2 migration to make transition as smooth as possible while giving everyone ample time to switch. It is now nearing the EOL of API v1 and as such we would like to remind everyone to please switch to API v2 as soon as you can. Check the documentation for more details and a special guide written on how to migrate your tools from ark-node v1 to the new Core v2. In general, you have two options to choose from, but we highly recommend the first — using the official ARK Crypto and Client packages. Use our crypto and client SDKs in your code. By doing so you will have full support for upcoming releases and no further migrations will be needed besides updating versions of our maintained SDKs via respective package repositories. We have SDKs (client and crypto) implementations available in more than 12 programming languages. CLIENT to handle the REST API communication part. CRYPTO for transaction building & signing.